PSNI raids in West Belfast last week connected with last year's Northern Bank robbery caused anger in nationalist circles, especially as one of the premises targeted was Antrim GAA's Casement Park headquarters. The raids, which come at a sensitive time for the GAA, have caused even more people to question the wisdom of the organisation's decision to lift Rule 21 and allow members of the British forces play Gaelic games. The home of Aidan Digney, a member of the West Belfast Glasgow Celtic supporters' club, Eire go Bragh, was also raided. Both raids were carried out on Friday 2 December just hours after the PSNI were granted a 60-hour extension to hold and question 24-year-old Chris Ward, the Northern Bank employee arrested last Tuesday 29 November. And reacting to the latest raids Sinn Féin Assembly member Michael Ferguson accused the PSNI of returning to, "1970s style policing". 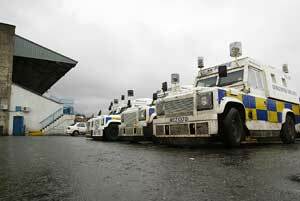 On Friday a large number of PSNI and up to 15 Land Rovers stormed into Casement Park on the Andersonstown Road in West Belfast at approximately 7am. They told staff that the raid was part of an ongoing investigation into "organised terrorist crime". The raiders took files and documents relating to wages and accounts including cheque books. Confirming that Chris Ward worked part time in Casement Park Social Club, Gerry McClory, Vice Chair of the County Antrim Board, said there was something something sinister about the approach. "It was complete overkill. It was an attempt to discredit our members. We have nothing to hide and have assisted the PSNI with their inquiries. Do you think we have £26 million hidden in the changing rooms?" President of the GAA, Séan Kelly said: "We know what the PSNI are doing. Even if it is coincidental, we are not happy. It is too much. GAA supporters across the country aren't going to be influenced by such actions by the PSNI." The GAA have said they will be reporting the matter at the "highest level to the Dublin Government". Meanwhile, a man whose home was raided by the PSNI on Friday 2 December in connection with the 2004 Christmas bank robbery has described the raid as "nonsensical". Aidan Digney who is a member of Eire go Bragh CSC, the same club as Chris Ward, was speaking after six PSNI vehicles arrived to search his West Belfast home. "They told me they were there in relation to the robbery and asked whether I had any money or walkie talkies in the house that they should know about." Digney said he, his wife and children were put in the kitchen of his Poleglass home while the PSNI carried out searches. West Belfast Assembly member Michael Ferguson said the PSNI raid was reminiscent of the interrogations of the 1970s. "This is symptomatic of the Castlereagh interrogations that took place in the depths of the conflict. These raids are designed to put immoral pressure on Chris Ward and criminalise this young man who has always maintained his innocence."